[…] By the 1971 Three Clarinets, Cello, and Piano, Feldman had perfected his mature language, consisting of isolated blocks of sounds, floating in time’s amniotic fluid. This work is austere, and largely non-repetitive, even though it is highly static. A decade later in Bass Clarinet and Percussion (1981) and Clarinet and String Quartet (1983) the music has advanced a step further, in that now slowly repeating textures are allowed, and its scale is expanding. The work with clarinet is not on the level of the gargantuan Second String Quartet, but its more-than-forty-minutes duration certainly evokes an image of timelessness. And the work for bass clarinet is quite simply a masterpiece, suggesting a deep mystery in its dark rumbling sounds, its barely audible whispers from the clarinet, and its periodic delicate ‘tickings’. One thing that emerges from these pieces is that by this point (near the end; the composer died in 1987 at the too-early age of sixty-one), is that Feldman had become a master in his manipulation of motive, which ironically links him with the great German tradition through Schoenberg, Brahms, and Beethoven. The simplest ideas repeat and mutate effortlessly, hypnotizing and drawing the listener through a dream that is the music. Towards the end of his life, Morton Feldman abandoned descriptive or poetic titles for his works, labelling them instead simply by their instrumentation and in the process underlining the wonderfully abstract intensity of the invention. On this beautifully nuanced disc, with limpid clarinet playing from Carol Robinson, Three Clarinets, Cello and Piano (1971) is the earliest piece, juxtaposing tight-packed clarinet lines with pizzicatos and suspended piano chords. The 1981 Bass Clarinet and Percussion suspends solitary melodic lines over steadily shifting patterns of drum pulses, all within a dynamic envelope that never rises above a whisper. Clarinet and String Quartet (1983) is a much more substantial work, over 40 minutes; the sound world is as sparing as the musical material, but the microscopic variations that Feldman imposes on both are compelling. Oddly enough, Feldman’s clarinet works remain a still relatively unknown section of his oeuvre. With the exception of the now deleted 1995 recording of Clarinet and String Quartet (1983) and Two Pieces for Clarinet and String Quartet (1961) on Hat Hut (ART CD 6166), this installment of Mode’s Feldman Edition is, I believe, the only disc to exclusively feature pieces written by Feldman for the instrument, and to be clear from the outset: it’s a cracker. Featuring Carol Robinson on clarinet and bass clarinet, the disc is a worthy companion to her recordings of Giacinto Scelsi’s wind music on Mode 102 last year with Cathy Milliken and Clara Novakova. Indeed, if that isn’t recommendation enough, the three works on Feldman Edition Seven – Three Clarinets, Cello and Piano (1971), Bass Clarinet and Percussion (1981) and Clarinet and String Quartet (1983) – all specialise in that much loved Feldman illusion: each piece psychologically stretches its actual playing time beyond all recognition. There is more than enough to hold your interest over repeated / extended plays here, and I assure you that after your first listen you’ll feel that far longer than seventy minutes have elapsed. Paradoxically, the short spacing between the pieces helps maintain this temporal mirage: a seemingly minute point perhaps, but worthy of comment. We’ve become accustomed to hearing extended breaks of programmed silence between Feldman pieces, and its refreshing to see a successful move in the opposite direction. You might be rightly sceptical, but once heard, there is no doubting the success of the choice as the three pieces pass into one another. The disc’s first piece Three Clarinets, Cello and Piano featured on the Barton Workshop’s Voices and Instruments CD (Mode 107): an earlier disc in the edition that unfortunately suffered somewhat from a rather dry recording. Here, along with Pierre Dutrieu and Olivier Voize (clarinets), Elena Andreyev (cello) and Vincent Leterme (piano), Carol Robinson’s performance is more engaging and ultimately more satisfying. Recorded in the manner we’ve come to expect of Mode, the listener can better grasp the dynamics of the piece here, and the interplay between instruments is sharp and defined as sounds cluster around one another. For those not familiar with the work, it’s interesting to note that the piece shares its date with Rothko Chapel and I Met Heine on the Rue Fürstenberg; both larger pieces of course, but if you enjoy these better known pieces, seek out Three Clarinets, Cello and Piano. It’s an interesting exercise to play it between them, and hear the same techniques and ideas used in a reduced setting: the lines from solo instruments making their way out across the expanse whilst still managing to curl up around one another. And although it’s a particularly ego-less piece, a special word should be given to Vincent Leterme for his performance. He gives an impressive account of the piano part, recalling, I feel, Feldman’s own playing with a touch equal in decisiveness and sensitivity. As Three Clarinets, Cello and Piano dies away, the disc jumps forward ten years in five seconds of silence and ‘Bass Clarinet and Percussion’ (1981) begins with a meandering, high-end line from the bass clarinet backed by a percussive shimmer. Even more than most Feldman pieces of the period, the sounds of Bass Clarinet and Percussion are other-worldly – oceanic perhaps – and although I’m no expert in such things, it’s clear that the clarinet line demands virtuosity, juxtaposing notes from the top and bottom ends of the instrument’s register. Peppie Wiersma’s percussion is more than equal to Robinson’s playing, however, and this fascinating seventeen-minute dialogue is, for this listener, the highlight of the disc. Colours and textures abound with characteristic Feldman shading, and similarly, the rhythmic play seems typical. Whilst the percussion remains steady in 3/4, the clarinet weaves around it, highlighting and repeating sounds with a drawn-out ethereal resonance that complicates and splices the rhythm. Somewhat surprisingly given that this is late Feldman, I can imagine this piece would lend itself quite beautifully to choreography, and even more so than Three Clarinets, Cello and Piano, it stands as a wonderful example of how the ethos of Abstract Expression can be translated into sound. The disc’s final piece is the longest and Clarinet and String Quartet (1983) clocks in here at just over forty-two minutes. Some things are relative, of course, and the piece is short when compared to the other ‘and String Quartet’ pieces: ‘Piano and String Quartet’ (1985) and ‘Violin and String Quartet’ (1985). Certainly, Clarinet and String Quartet looks forward to these later works, but it is a fascinating piece in its own right, and if you’re a fan of these then this disc is a compulsory purchase. A working example of the composer’s dictate about the necessity of taking account of how an instrument actually sounds when writing for it, Clarinet and String Quartet is remarkable for the manner in which the soloist foils the quartet and vice versa. Indeed, one can easily hear something of a ‘crippled symmetry’ at the level of the sound itself: the similarities in tone being just enough to suggest difference and repetition. It is as if the listener is party to a morphing of instruments. Now in their seventh year, Quatuor Diotima play beautifully with Robinson, and as is the case throughout, you can’t fault the quality of the production, which is, incidentally, also Robinson’s work. The disc’s packaging continues Mode’s high standards and I continue to prefer their sleeve notes to the sometimes ‘too-arty’ accounts by Art Lange that accompany Hat Hut releases. Indeed, although Robinson’s own comments are a little technical, she successfully opens the way for a better hearing of the three pieces. To my mind, this disc is one of the highlights in Mode’s edition thus far, and that obviously makes the release simply essential. […] I’ll cover two recent releases, both top-notch. 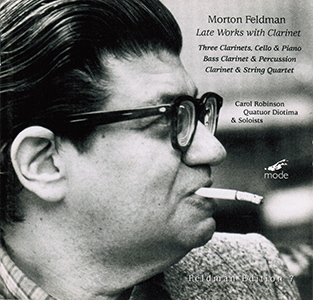 The first, mode 119, Morton Feldman: ‘Late Works with Clarinet’, reminds us that Feldman (1926-1987) ranks among the 20th century’s foremost sensualists. And of course provocateur, but of a different stripe. Parsimony and time comprise the man’s goads. The music subverts via a serene – indeed dogged – unflappability touching upon a trance state. Un Feldman à la française, et enregistré en France, comme nous l’attendions ! La Suisse alémanique et l’Allemagne restaient jusqu’à présent la source principale, sinonunique, des concerts et des disques de l’ ‘école de New York’. Et même dans la maison américaine Mode, qui accomplit un pieux devoir patriotique, les bandes proviennent souvent de stations de radio germaniques. C’est notre faute, c’est tout. L’intérêt de ce regard français tient à éprouver l’universalité de Feldman, dont nul ne doute certes, mais par l’oreille même, c’est-à-dire à la vivre. Que cet abord nous vienne avec un choix d’œuvres ayant trait à un instrument français, le petit clarin ou clarinette, ajoute à ce charme. Car il s’agit, avec Feldman plus qu’avec tout autre, d’un ‘univers sonore’, mot de Schoenberg que cite Carol Robinson. D’une rare plasticité, l’œuvre de Morton Feldman plane ‘dans le silence comme si elle cherchait à le rendre audible, presque toujours doucement, pour ne pas recouvrir le son du silence’ (Emstalbrecht Stiebler), car c’est aux frontières de l’indicible que se dessine cette écoute raréfiée. Ce commentaire s’applique particulièrement à ‘Trois clarinettes, violoncelle et piano’ de 1971. Quelques clusters saillants, des crescendos qui s’évanouissent : un temps suspendu posé sur une gamme infinie de nuances. Dix ans plus tard, avec Clarinette basse et percussion (1981), le souffle de l’instrument s’enroule autour de la cymbale pour une sonorité cotonneuse au rythme lâche. Pièce majeure des dernières années, Clarinette et quatuor à cordes (1983), engage une conversation au ralenti où mots et accords feutrés s’entremêlent au point que l’instrument à vent se confond avec les cordes. Emmenés par la clarinettiste Carol Robinson, qui a participé à de nombreuses créations, notamment de Giacinto Scelsi, les Français du Quatuor Diotima, le pianiste Vincent Leterme, les clarinettistes Pierre Dutrieu et Olivier Voize, la violoncelliste Elena Andreyev, ainsi que les percussionnistes Françoise Rivalland et Peppie Wiersma, trouvent les sonorités les plus délicates pour cette musique arachnéenne. Bien qu’elle repose pour une large part sur la répétition, la musique de Feldman peut difficilement être qualifiée de répétitive; de la même façon, si son matériau est souvent très restreint, elle correspond bien peu à l’idée minimaliste; enfin, les procédés combinatoires ne lui sont pas étrangers, et néanmoins elle n’est tributaire d’aucun système. Ces apparentes contradictions se dissolvent sur une surface musicale étale, apparemment débarrassée de toute tension, où la dialectique formelle laisse place à une succession de moments dont la cohérence d’ensemble ne fait aucun doute. Le programme du septième volet de cette ‘Feldman Edition’ permet d’appréhender une temporalité très originale, susceptible d’entraîner l’auditeur dans une écoute contemplative. On peut identifier dans ‘Three Clarinets, Cello and Piano’ (1971) les processus qui se conjuguent pour dessiner trois sections (gradation entre les attaques douces et les attaques franches, émergence puis dissolution de deux segments chromatiques complémentaires) ainsi que les repères stables (récurrence d’une séquence harmonique, répétitions de motifs). Le déploiement de ‘Bass Clarinet and Percussion’ (1981) repose quant à lui sur la distinction, peu identifiable cette fois, de deux plans rythmiques qui ne se rejoignent qu’épisodiquement, à l’instar de la clarinette basse qui, selon le registre, se fond par intermitence dans le halo harmonique des percussions. C’est encore une construction tripartite qui sous-tend ‘Clarinet and String Quartet’ (1983), mais curieusement, la répétition, présente à divers niveaux structurels, n’oblitère pas une perception fluide du temps. Un motif chromatique de quatre notes, au fil de ses permutations et extensions, alimente une trame – la métaphore textile prend ici tout son sens – largement hétérophonique. Le mérite principal des interprètes, exemptés de toute performance technique, est d’avoir su caler leur temps intérieur sur celui des œuvres, de nous permettre de nous installer dans l’apesanteur d’une durée abolie. One of the characteristics of Morton Feldman’s music is the way silences are thrown into stark relief. Each silence – freighted with memory, charged with expectation – becomes a unique presence in the music more than merely an absence of it. Though his silences are measured in units of time, they also contain an intimation of infinity. The music of the “classical” tradition slows down, speeds up, lawyers and otherwise manipulates time. Of the other arts, only cinema plays with our temporal perception to a greater degree. But we’ve come so accustomed to this happening that we hardly notice it. Feldman’s music, especially that of his later years, more nearly approximates the quotidian time of which we’re only fleetingly aware. If his music seems strange, it’s not because it employs the temporal distortions to which we’ve become accustomed but, on the contrary, because it doesn’t. Feldman takes three slightly different approaches to time and silences in Late works with Clarinet. Either by luck or calculation, these roughly coincide with the major developments in his music. In Three Clarinets, Cello & Piano (1971), a piece that sums up the achievements of his early career, the sounds are freefloating and unpredictable, a series of seemingly random but beautifully configured musical events. Written a decade later, Bass Clarinet & Percussion has a chiming ritualistic quality; the music is episodic, slyly repetitious, simultaneously lulling and disruptive. By comparison, Clarinet & String Quartet (1983), although nakedly repetitious, employs the subtle thwarting of expectation that is so typical of the compositions of Feldman’s last five years. Here silence is woven through the sounds, creating a flexible, airy matrix. Clarinettist Carol Robinson, the Quatuor Diotima, and the other instrumentalists involved in this production have avoided one of the bugbears of recent Feldman performances: Mozartisation, where the sheer sonic beauty of a work is over-emphasized, and insufficient attention is paid to the other aspects. But throughout Late works with Clarinet things are just as they should be. The mere thought of Feldman and the clarinet is enough to send shivers of anticipation down one’s spine, so Late Works with Clarinet was an eagerly awaited release. Three pieces featuring Carol Robinson on the sultry reed are offered, beginning with “Three Clarinets, Cello and Piano.” The 1971 work hails from that intermediate moment in Feldman’s career when his earlier sparse purity was beginning to give way to a relatively sensual minimalism. It’s a short piece by his standards, less than ten minutes, but contains an expansively breathlike quality, the three clarinets in near unison wash against the cello and piano, sometimes reaching surprisingly loud and emotional points. If the clarinet causes one’s whistle to whet, the idea of Feldman composing for bass clarinet might lead to uncontrollable drooling. The deep, woody tones of the instrument would seem to be a perfect match for Feldman’s soft, profound ruminations. “Bass Clarinet and Percussion” (1981) is a darkly gorgeous piece, rich and mysterious, in its odd way extremely romantic. The percussion (largely tympani and gongs) lays out loose patterns in one implied rhythm, the bass clarinet (often played in its higher ranges) slightly off-rhythm, creating a floating sense of serendipitously interlocking paths. In some ways, it’s everything a late Gavin Bryars should be but never quite is. The disc closes with the lengthy (42 minutes) “Clarinet and String Quartet” from 1983, wherein the action maintains a surface similarity — the reed playing four and five note patterns over breathing string harmonics — but, of course, the reality is consistently changing, each phrase subtly different from the last like the adjoining weaves in the Turkish carpets Feldman so admired. The piece continues on almost granularly, each moment relating only to its immediate predecessor and descendent, beautiful molecules drifting off into the ether. Late Works with Clarinet is a lovely recording, a must for all Feldman admirers. La atracción de Feldman por el clarinete se intensifica en el último tramo de suvida. No es el suyo el primer caso. Antes, les había pasado también a otros compositores: Mozart, Brahms, Reger… Las razones de esa predilección tal vez residan en el timbre otoñal y pastoso del instrumento, anunciador de una suavidad cálida y amorosa al mismo tiempo. Ya en el extático y excelente Three Clarinetes, Cello and Piano, de 1971, los tres clarinetes son los protagonistas de una naturaleza muerta instrumental de suavísima y entrañable factura, al borde del estatismo e impregnada de tonalidades rosadas. Bass Clarinet and Percussion, de 1981, sigue coordenadas parecidas, con sonoridades infiltradas por el silencio, que en la parte central alcanzan una contenida (aunque ilusoria) movilidad. Clarinet and String Quartet, de 1983, es una de las cumbres del último Feldman. Aquí el compositor se mide con una plantilla dotada de cierta tradición: el quinteto con clarinete. Más que evitados, los clásicos antecedentes de Mozart y Brahms parecen aquí transcendidos en los lentos movimientos repetidos en espiral, despojados de toda cáscara material y convertidos en puros retazos de dulzura. Enfrentado a las cosas últimas, el compositor americano propone a sus oyentes una música ni antigua ni moderna, sedosa e intemporal. La clarinetista Carol Robinson posee la delicadeza, la pulcritud y la paciencia que estas páginas requieren. Mágico y exigente.